Among the 290 auction lots for sale at Brian Lebel’s 29th annual Cody Old West Auction in Santa Fe, are items with Santa Fe or New Mexico history, including a Slim Green Rodeo de Santa Fe parade saddle; items from the collection of former Santo Domingo Governor Jose Reano; the original 1880s tin sign from the Lincoln Saloon; pottery by award-winning Pueblo potters; and sculpture by late Santa Fe artist, Ernest Badynski. The 29th annual Cody Old West Auction is pleased to offer a number of auction lots with connections to historic New Mexico figures, places and artists. Approximately 290 total lots will cross the block at the live auction, including a “Rodeo de Santa Fe” parade saddle created by noted New Mexico maker, Slim Green, which is estimated to sell for between $12,000-16,000. Slim was one of the co-founders of the Rodeo de Santa Fe, and he crafted the custom leather-tooled and silver engraved showpiece in the 1950s for fellow Rodeo Board Member L.L. Langley. Complete with matching bridle and breast collar, according to Slim, he made the ensemble in exchange for “some real estate.” The live auction will be held Saturday, June 23rd beginning at 5:00 pm in the Santa Fe Community Convention Center; absentee, mobile, telephone and online bidding options are also offered. Pre-auction estimates total over $1.4 million. A preview is held on Friday and Saturday, and both the preview and auction are free and open to the public. Also of New Mexico interest at the auction is the original tin sign that hung on the front of the infamous Lincoln Saloon in Lincoln, NM. Pictured in numerous photographs from the late 1800s, the sign hung across the street from the Lincoln County Courthouse where Billy the Kid shot and killed Pat Garrett’s deputies while making his escape. When assembled, the hand-painted sign measures over 22 feet wide and 9 feet tall (estimate: $8,000-12,000). 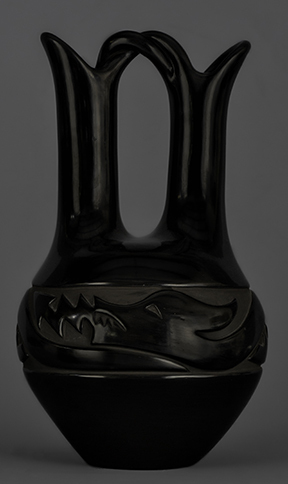 Museum-quality Pueblo pottery will be offered at the sale, including a circa 1900s Santo Domingo jar that was once in the collection of Jose Reano (estimate $8,000-10,000), and a Santa Fe Indian Market award-winning black-on-black wedding jar by contemporary potter Mary Singer (estimate $4,000-5,000). A large, copper sculpture of a tree and nest by late Santa Fe sculptor Ernest Badynski will also be sold (estimate $600-900). In conjunction with the Saturday night auction is the 29th annual Cody Old West Show. The show features over 100 national vendors of authentic western art, antiques, apparel, décor, jewelry, collectibles, antique firearms, Native American arts and artifacts, photography, boots, books and other fine western merchandise in all price ranges. Although vendors come from across the country, approximately 25% are from the state of New Mexico. Museums, publishers and non-profit organizations round-out the exhibitors. General admission is $10 per day, or $15 for a weekend pass. Attendees under 12, over 70, or active military receive free general admission. Both the Show and Auction will be held at the Santa Fe Community Convention Center, 201 W. Marcy St, Santa Fe. Details, schedules, discount offers, hotel partners, auction highlights, vendor lists and much more can be found at www.oldwestevents.com or by calling 480-779-9378.